As of this writing, I haven’t watched “GI Joe: Rise of Cobra” yet. I will, I just haven’t had a chance yet. Overall, the movie line of GI Joe figures has grown on me. However, the nearest Wal-Mart reduced their prices on the standard figures to $6. That makes me like them a whole lot more. 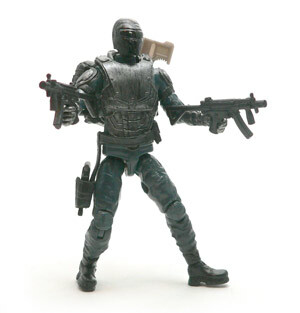 Since I’d recently reviewed the Pit Commando, I figured it would only be fair to review a Cobra figure. I really wanted some general Cobra figures to fill out their ranks. Can’t have an army without troops. I really am not a huge fan of the general look of the Vipers. They just don’t seem very Cobra to me. The faces seem a little to alien to be real. That being said I spotted this guy on the pegs, the Elite Viper. The armor is toned down quite a bit and the head is more of a helmet and mask combination than an alien head. He edged out the Para-Viper narrowly. At this point, I’m wondering if this guy is in the film. Hasbro has made a number of figures in this line that are not in the film. However, thanks to the realistic way all of the figures are styled, it’s hard to tell. 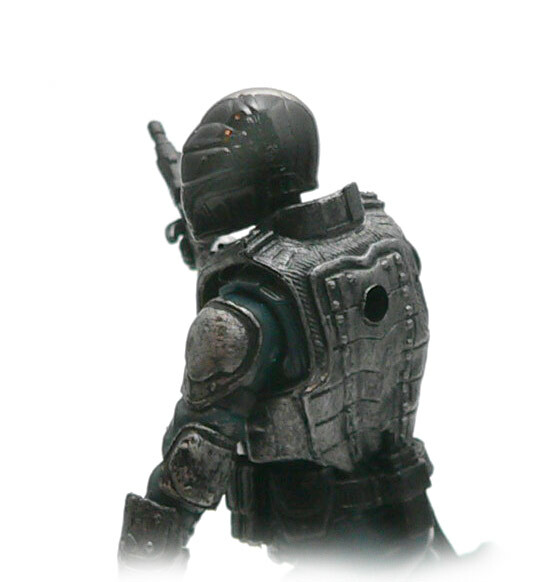 As I said above, the armor is toned down a bit from the standard Viper figures. There are armor plates sculpted onto his shoulders and elbows. If they had been painted black, they would have looked like any of the standard plastic elbow and shoulder pads you see SWAT teams on TV wearing. The main armor piece is a body armor vest. 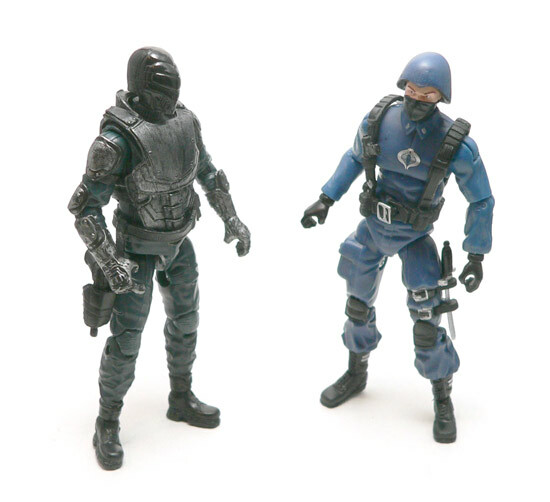 Hasbro seems to really have embraced the removable vest piece with the newer Joe lines. This one has a clasp on one side. There’s some over lapping plates on the front and back. The thing that I’m most impressed with is the paint. The piece really has the look of a metalish sort of armor. The front of the vest reminds me a bit of the vintage HISS driver. Really, other than the armor, there isn’t very much paint. the head is molded in a single color. The only other spot of paint really is the boots. Nothing too exciting there. It seems most of this line is wearing combat boots. The one bit of paint I’m disappointed not to see is a Cobra logo. They felt the need to put one on Baroness, why not a soldier? I actually think a small one on his shoulder would have been cool, but subtle. 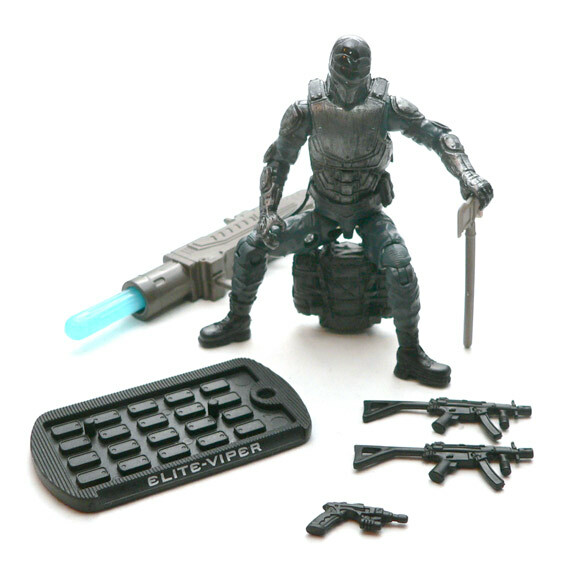 I believe one of the multi pack Elite Vipers has a small silver Cobra logo on his chest plate. 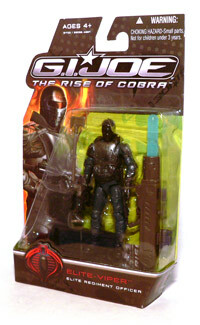 Without it, there is nothing that sells this as a Cobra figure. He’s generic enough to be from either side. I will say my favorite bit of kibble is the radio on the back of the belt piece. It’s a standard walkie talkie. I just wish the holster would anchor to his leg. If you have read any of my other GI Joe reviews, you will have guessed I picked this guy up because of the amount of gear that he has. You would be correct. Two machine guns, a Cobra pistol, backpack, and ax. Oh and lets not forget, a stand and gimmick projectile shooter. When I first got everything out of the blister, I noticed two small odd squares on the backpack. It took a minute, but I figured out that the extra front handles on the machine guns formed a spot where the guns would fit. The pack also has a notch where the ax fits. Combine that with fact that his pistol fits in this holster, and this trooper can carry all of his gear, hands free. Pretty niffty. While all of the gear is pretty generic, it’s mostly well done. The only thing I would change with the accessories is maybe a bit of paint on the ax. It seems a tad bit too plastic like. All of the articulation you would expect is there. It all works the way it should. None of joints are limited in their movements. For being a fairly generic figure, I was impressed. All of the detailing is there for what you would consider a hero character. There are plenty of accessories and articulation. Except for the floppy holster and lack of an emblem, I really can’t thing of anything negative about this guy. He’s very similar to the Pit Commando in that regard. A really good generic army builder. If you’re a customizer, I would think he could be the base of a number of figures. While I was a bit disappointed in some of the 25th Anniversary figures, I have to say the movie line has impressed me in general. And with a lower price, I migh have to pick up a few more troops for the Joe vs. Cobra battle. Deadpool701 on Twitter helped me out. He tells me there are two Elite Vipers guarding the entrance to the arctic base. On the whole, I hadn’t been too attracted to the Cobra figures from the movie. 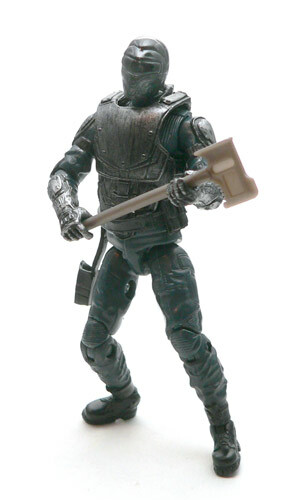 It’s not that I don’t appreciate the figure’s design, but the aesthethic of the evil troopers doesn’t quite grab me. Of course the accessories do tip the balance a little for me, but not quite enough…yet. I only had Cobra Commander, Firefly and a Hiss Driver from the vintage line. I’m just trying to build my Cobra forces a bit. I actually had considered the Cobra Eel and the Para Viper. The Para Viper reminds me, except for color scheme, quite a bit of the vintage Ripcord. 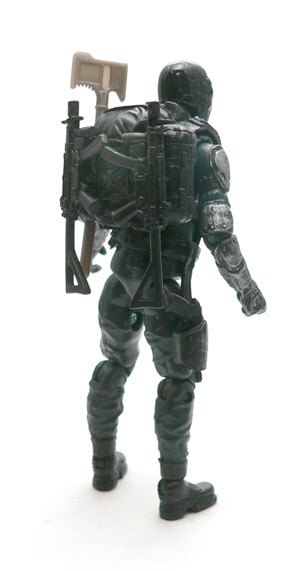 But since the movie has remade Ripcord into a major Joe that is completely different from the vintage one, I doubt we’ll see that figure. I kind of wonder now why they didn’t call him Stalker in the movie, it would have made more sense. Probably cause it sounds creepy. Beats me. The whole trademark issues that prevented them from calling Roadblock the character presented as Heavy Duty is beyon my comprehension. Ironically, I saw three single carded Elite Vipers tonight. And a Desert Viper.